Leave a review and share your experiences with QuiBids! What happens if I lose an auction? If you lose an auction, you don’t have to walk away empty-handed. With QuiBids’ Buy Now feature, in any auction you lose, the bids you placed will be applied to the retail price of the product. So the best case scenario, you win the auction and get a HUGE discount. But with Buy Now, the worst case scenario only has to be that you purchase the product at retail. 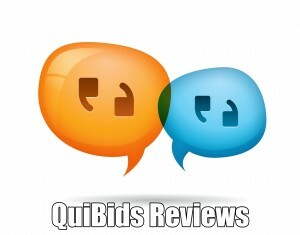 This is why QuiBids recommends only bidding on products you intend to purchase anyway. This prevents you from ever walking away from an auction with nothing. Is QuiBids Really a Fake? Some people on the internet claim that QuiBids is a sham. Typically, the people who make these claims fail to read the massive wealth of knowledge provided in the QuiBids 101 and Help sections of QuiBids.com. Just look at all of these happy QuiBidders who are using QuiBids the right way, and subsequently reaping the rewards. Do you have experience with QuiBids? Good or bad, feel free to leave your honest QuiBids review below.